EXCLUSIVELY AT NEIMAN MARCUS Diamond-pattern ruffled dust skirt. 17" drop with open corners. Main: polyester/rayon. Backing: cotton. Trims: polyester. Dry clean. 60" x 80". Made in the USA of imported materials. Sham with miniature textured diamond pattern. Contrast flange. Polyester. Feather insert included. Dry clean. 27" square. Made in the USA of imported materials. Paneled sham with ruched sides. 21" x 37". Polyester; polyester/cotton. Faux feather insert. Made in the USA of imported materials. Paneled sham with ruched sides. 21" x 37". Polyester; polyester/cotton. Faux feather insert. Made in the USA of imported materials. Shipping: Direct from vendor, usually ships within 21 business days. 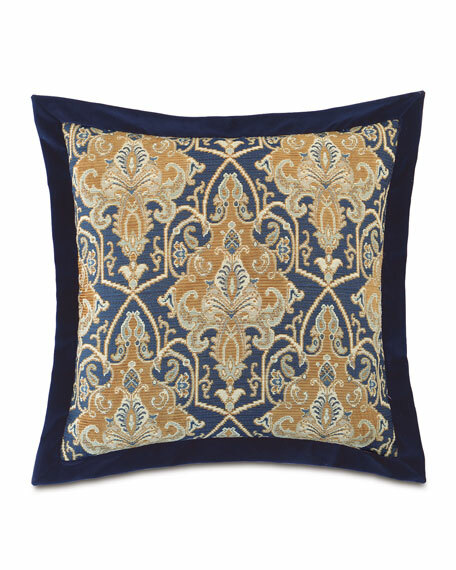 Pique matelasse sham with striped border. Cotton, with a mercerized finish for softness. 26"Sq. Machine wash. Made in Portugal.